This one just makes me angry. So, the other day I’m walking up Steinway Street towards the Museum of the Moving Image to go shoot some party for my Brownstoner column. 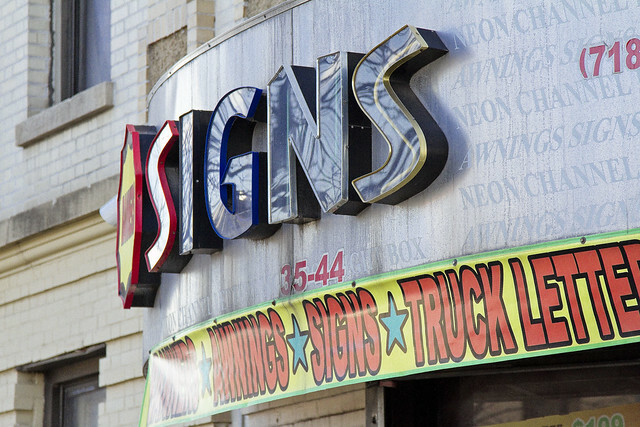 It’s not the sort of thing I’d EVER cover for your Newtown Pentacle, of course, but there you go. As I’m walking along, what seemed at first to be some sort of weird statuette in a store window began to move, and that’s when I noticed that this particular shop had a live and quite exotic bird living in its front window. An extremely ill one, at that. Awww, hell. Cue the Sarah McLachlan music. This poor thing had pecked and scratched itself bald. Our Lady of the Pentacle, upon examining these rather ugly photographs, offered that the bird likely has untreated mites or some other parasitic infection. It chest was quivering, and the beating of the heart and action of respiration was quite visible. When I see a bloodied drunk laying face down in the street, I know what to do. Same thing with a fire, or car accident, or even who to complain to about excessive noise emanating from a commercial business. Smell the sewer? Spilt some oil? Yup, I can tell you whom to call and what to tell them. A sick bird? Is it even my business, this? Who do you call? Sure doesn’t seem to be Police business. Am I meant to storm into the store and demand to speak to their Vet? Let’s just presume that this particular blog post is merely intended to point out that there seems to be a pretty sick bird, in a shop window on the west side of Steinway Street in Astoria, between 35th and 36th avenues. That bird… well, there might be certain signs that someone versed in handling this sort of situation could observe to find and help it. I’m truly ignorant on the subject of avian veterinary health, perhaps that shivering miserable looking creature isn’t as bad off as it looked to me, and I’m simply over reacting. 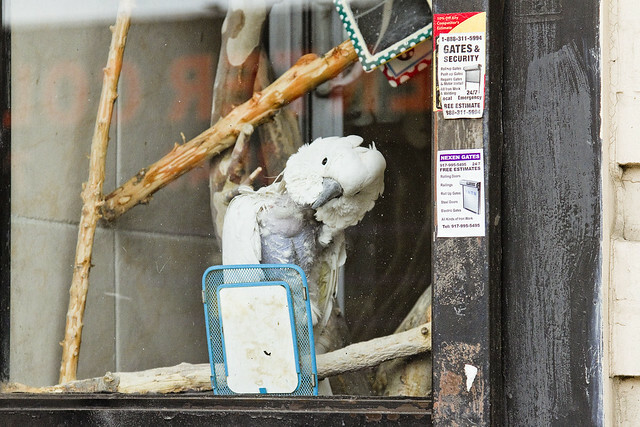 My name is Kim, in the news gal over at Greenpointers.com and a former parrot owner. I had a similar experience a while back with languishing parrot in the back of a GP pet store. 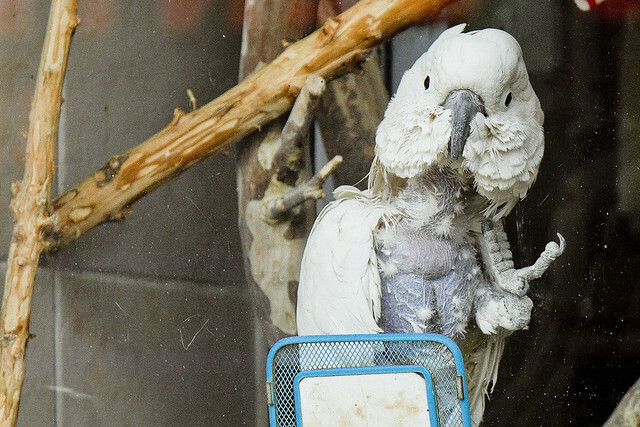 While not as bad of a case as the poor bird above, the sickly bird I encountered was eventually rescued and placed in a Texas parrot sanctuary. 1) Report the incident to the police. The ASPCA is now under the police division. This is probably one of the worst parrot conditions I’ve seen in a pet store. Shame on them. This could clearly be a animal abuse case. 2)The Manhattan Bird Club (212) 987-8299. They were instrumental in helping to rehome the parrot I mentioned. Frankly, when I spoke with someone here about my own experience, the issue left my hands and snowballed into something much greater. It was through the bird club this poor animal was rescued and relocated to an animal sanctuary. 3) Contact either of these vets Dr. Pilny @ The Center for Avian medicine (212) 501-8750. Or Dr. Queensberry @ The Animal Medical Center (212) 838-8100. Either one will tell the best way to proceed with such a case. I hope this helps you and more importantly I hope this bird can get out of there and into a nice place where he/she can live out her years in peace. 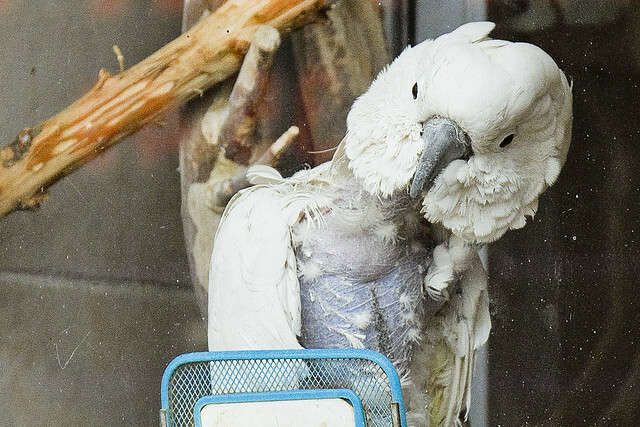 Cockatoos can live up to 80 years. She still has a full life ahead her. Thanks for putting this out there. I wonder if the bird is still in the window. Pretty late on this one, but just wanted to pipe up. This is a common condition in parrots in captivity. It’s rarely caused by mites or anything physical. It’s a psychological problem akin to people who pull their own hair out. The bird is self mutilating because it’s bored, lonely, frustrated, whatever. Parrots (this is a cockatoo) are very intelligent animals, bond deeply with their mates, and are strong fliers who can go pretty fast and far. Life in captivity just doesn’t suit some of them. Best thing would be for the bird to go to a sanctuary and be given a mate. Some have been treated with antidepressants, because what they are doing is sort of a form of OCD.